Bumbershoot Takeaways: Why Does Weezer Still Exist? The alt-rock titans of the '90s and '00s fell flat compared to Seattle upstarts. 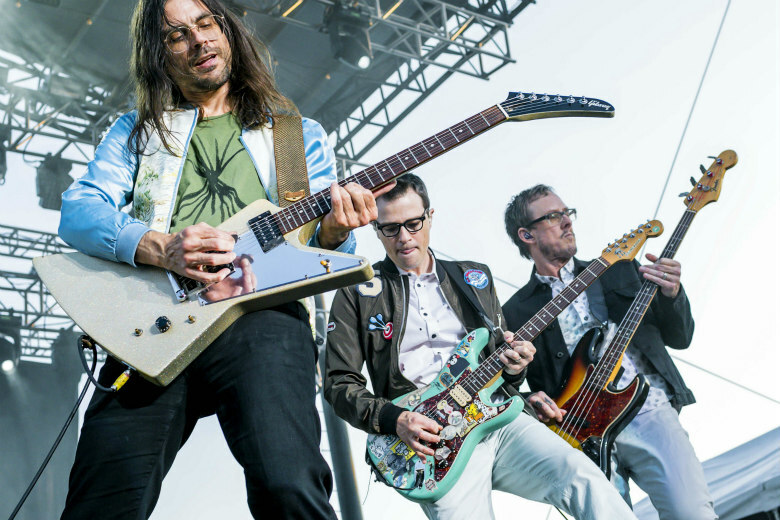 During its lifeless Bumbershoot set on Saturday, Weezer even made an OutKast cover feel drab. Bumbershoot sits alongside 107.7 the End's Deck the Hall Ball as the city's big rock show training wheels. On Saturday—day two of the three-day, festival—I thought it appropriate to bring a young man of 6 along for his first run through the fans, bands, lights and sounds. He'd been to Bumbershoot before, but this would be the first one he'd remember. What better way to inaugurate the rock show experience than with Weezer? Personally, I was hoping for proof that there's a reason for Weezer to still exist. Few bands have the live ammunition as Cuomo and company. Seeing a Weezer set live is a good reminder of how much they dominated the alt-rock radio landscape in the '90s and, in many ways, even more so in the 2000s. There are few bars a band has to clear to make a show meaningful. One is to at least to appear to want to be there half as much as the crowd. The other is to make performing seem like a necessity; like it's something they'd rather do than spend the entire day in bed. Weezer failed on both counts. Miserably. The crowd—kids covered in glitter who came to see Lorde—was far more excited to sing “Island In the Sun” and “Buddy Holly” than Cuomo. Proof that an uninspired set by one of the bands in your dad's CD player doesn’t have to spoil your evening. There was a time when it was worth the cost of admission to see the intensity in Cuomo's eyes. Count him among the ranks of former alt-rock hitmakers who have forgotten how to do what they do on stage and make it interesting. It's hard to articulate and even harder to execute. On this front, pleasant Seattle rockers Ruler succeeded. The first band on the Memorial Stadium main stage Saturday afternoon was obviously excited by the setting and the opportunity. They were at their best when they when they leaned in and flexed, pushing their indie rock forward. Twelve years later, 2006 indie rock sounds uninspired when it's not punched up (maybe it always has). Both bands were outdone—it was no contest—by Tacocat. The pop-rock punks are still unrefining their technicolored craft with great success. Seriously playful and irreverent, they brought that ineffable thing that Weezer couldn’t muster. Even his cover of OutKast’s “Hey! Ya” was somehow lifeless. Cuomo could have performed his set from one of the $70, inflatable vaginas that Bumbershoot sold as couches. I'm just glad my first-timer didn't have to see that. Check out photos from the quintessential Seattle fest here.